China’s new rail line connecting Mecca with nine holy sites in Saudi Arabia is a project India can learn from. While China is undoubtedly seen as a strategic rival by many Indian policymakers, this doesn’t mean there aren’t plenty of things we can learn from our neighbour. Take the country’s approach in the Middle East for example. 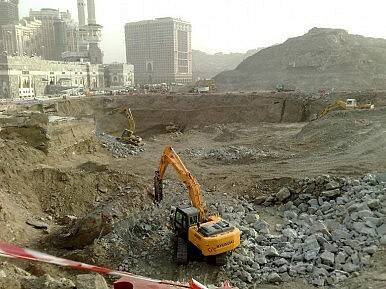 On the surface, there’s nothing particularly strategic about China constructing a metro rail link in the Saudi Arabian city of Mecca, the holiest meeting place in Islam. Think again. Last week, China announced the opening of a 20-kilometre, $1.8 billion rail line connecting Mecca with 9 holy sites in Saudi Arabia, including Mina, Arafat and Muzdalifah. The project was only awarded to the China Railway Construction Company in February of last year, so it’s a remarkable feat to have completed the task so quickly. China ensured that the line was operational a few days ahead of the start of this year’s Haj pilgrimage, although it was operating at half the passenger load it was designed for. The line—Saudi Arabia’s first dual track light railway project—is expected to be fully operational by next year’s Haj, when it will carry 72,000 passengers per hour. This is the first light rail system built by China in the Middle East and, knowing China, its firms will flock to such infrastructure co-operation projects. The Mecca project is a simple but masterly diplomatic move to win friends and influence people in the Islamic world, especially considering China itself has only 23 million Muslims, making up about 0.6 per cent of its total population. This latest development also won’t have gone unnoticed in India, which has the world’s second largest Muslim population—138 million (13.8 percent of the total population) according to the 2001 census. Over the past few years, India has substantially improved its ties with Saudi Arabia. For example, India made a song and dance (and rightly so) about the ‘landmark’ visit of King Abdullah bin Abdulaziz to India in January 2006; Abdullah was the chief guest of Republic Day celebrations and went as far as to say he considered India to be a second home. Abdullah’s visit culminated in the ‘Delhi Declaration,’ which covered strategic energy ties, while Indian Prime Minister Manmohan Singh paid a return visit to the kingdom earlier this year. The bottom line is: it’s hard not to feel admiration for this kind of Chinese dynamism. India has many things to learn from China; the sooner, the better. In China, the Hui Salafi sect, and its links with Saudi Arabia, have a long and complex history.